How will the Triangle look with a population of 2+ million? How different do you think the Raleigh-Durham area will be once it reaches 2 million plus? Good God, I had no idea Wake County was that close to 800K. Y'all are replicating faster than viruses up there. Its getting about time for downtown prices to level and for growth to slow or this train is going to fall off the tracks. Outside of 440 I sense quality of life issues starting to arrise as evidenced by the bits on small towns in yesterdays N&O. Inside 440 it is so expensive to live in the northern and western quarters that it is a shrinking option for most people. I believe the affordable areas inside 440 will disappear faster than people are anticipating. Keep in mind that the Census has consistently underestimated North Carolina's robust growth over the last quarter century. IN all likelihood, Wake County was already at 800,000 last July. Outside of 440 I sense quality of life issues starting to arrise as evidenced by the bits on small towns in yesterdays N&O. Yeah, apparently they quoted me in it (http://www.newsobserver.com/690/story/557076.html) where I say our suburbs are Stepford-like and growing like tumors. The only way Wake reaches 1million is with more projects like North Hills. If it keeps sprawling the way it has over the last 15 years, quality of life in the outlying areas will degrade so quickly that people will stop moving there and choose areas in Johnston and Franklin counties instead. It's getting to that point already. And really I don't see anything to prevent urban renewal projects like North Hills. There are plenty of sites that are attractive for that sort of thing - enough of them are sufficiently close together, I think, to potentially create a critical mass of urbanity in some areas over the next 10 years or so. I think Raleigh will start to look a lot more like a city, and a lot less like a suburb, by the time the Triangle hits 2million people. Wake will hit 1 million easily. There is so much more room for sprawling development within the county that it is not even funny. I bet if no more lots were approved for Wake county and just the current developments were to get built out, we are close to the 1 million mark already. Areas around Wake Forest, Rolesville, Garner, Knightdale, Wendell, Holly Springs, Fuquay, etc....Do you really think 1 mil is unreachable without urban development? I think we continue to see sprawling development and more urban projects in the future. Someone mentioned Atlanta and I think it is a pretty good comparison even though they are more like 5 mil. Maybe even Charlotte. It's metro is 2 mil+ and when we hit that mark, we will probably look about the same. I know I'm beating a dead horse, but the scary thing is if we don't plan with transit in mind (future lines to outlying towns like Wake Forest, Apex, Clayton, Rocky Mount, Goldsboro, etc), there will be little alternative for communities who want to encourage compact urban developments. As avery said, there's plenty of land available in Wake and unless you give them some incentive to build dense, they will likely just build more Wal-Marts and Home Depots. It will be precisely what these outlying communities do, and not just Raleigh, that will make or break the future for this area. Look at Fairfax County Va as a model for sprawl and a county that has over a million people living within its borders. Hopefully Wake will never become another Fairfax. To be fair though Fairfax has little in the way of urban living except maybe Fairfax City which is miniscule compared to it's population. I agree that Wake County will easily hit the 1 million marker, with or without more North Hills-like developments. Look at downtown Raleigh alone, they are building condos like mad down there, which will certainly play a big part in hitting the 1 million marker and they not like North Hills in any shape or form. I think his point was that dense infill of any type would be needed (I happened to disagree) but the refernence to NH was because it is dense infill amongst an otherwise suburban landscape. I believe there is a map out there that shows the potential build out of Wake County around 2030 or so. I have been unable to find the map or the reference... Anybody else with any luck would love to see it again. Actually, my point was that if the sprawl continues as it has, then Wake County will get so congested that fewer people will want to move here - choosing Johnston or Franklin counties instead. The only way that Wake County remains attractive enough to grow that much is with more projects like NH. I don't doubt that it has the area to hold 3-4 million (as someone else suggested) - but the question is whether those 3-4million will actually choose to move here. And if their choice is between an over-priced box off of Capitol BLVD with all of its sprawl and 3-hour traffic delays, and a lower-priced home with some open space in Johnston county and a 2-hour commute - well... it's hard to imagine Wake County reaching its potential under those conditions. Orange, Wake, and Chatham counties will continue to grow at fast rates, due to location, location, location to jobs and more urban areas,(where everyone seems to want to be). We will continue to see this area become more expensive because of this and the prices will keep going up from the $300,000 - to over $1,000,000.00 due to the afore mentioned location, location, location! But Johnston county,(esp. everything east of Clayton), will see a high rate of growth due in large part to cheaper land prices,(for now). So the way that I see it is there are many types of growth occuring in our area,(the Triangle), but is it growing to fast? To unabated? And most importantly uncontrolled? I believe Johnston County is about to see a slow down in its growth. County leaders have approved new regulations stating that new construction (in the county) must sit on at least 2 acres of land. The days of massive subdivisions in unincorporated areas of the county are over for now. This will contribute more to suburban sprawl by spreading the houses farther apart. The demand is still going to be there whether the commissioners like it or not. Let's not bother preserving any open spaces. We'll just plop all of the houses down on two acre lots and spread them all over the county. Good planning! You can't build a starter home on a 2-acre lot, sell it for $125,000, and expect to turn a profit. Most of the profit in developing subdivisions comes when you can subdivide the lots down to 4 units per acre and more. Cram as many homes in with as little infrastructure (water, sewer, roads, etc) as possible. The cost of building the infrastructure within the subdivision when lots are larger, means that only 'McMansion' type, large luxury homes can turn a large enough profit to attract the big-name builders. This coupled with the fact that people looking for houses in Johnston County are usually looking for a bargain, means that this should be a reasonably effective, though perhaps only temporary, control. A similar measure is the basis of Orange County's regulations that stop massive development by subdivision, though I believe the threshold in Orange is 5 or 10 acres, not 2. 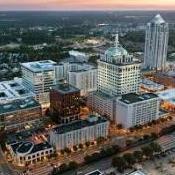 I predict growth in the Triangle for years to come despite traffic woes and "rising prices". The growth will be exponential. As long as the metro can provide jobs and urban amenities found in much larger metros for less, people will continue to migrate. Even though prices for homes are on the increase, they are really a joke when compared to the cost of a single family home or even a condo in MIA, CHI, LA, San Fran, Philly, DC/Balt, NYC, or the Pacific NW. I don't think we'll ever see home prices hit an average of 500-600K+ in the Triangle like they are in some of the metros I mentioned. Same reason why Dallas, ATL, and the Orlando metro have been booming and continue to do so.